Families in Nepal are celebrating the annual Hindu festival Gai Jatra, or the “Procession of Cows,” in an effort to help deceased loved ones reach Heaven. The festival is said to have its roots in ancient times when Hindus worshiped Yamaraj, the “god of death.” According to Hindu beliefs and legend, people would hold the tail of a cow as they crossed the Baitarni River in order to make it to Heaven. In the religion, cows are sacred, and even their dung and urine is seen as valuable. 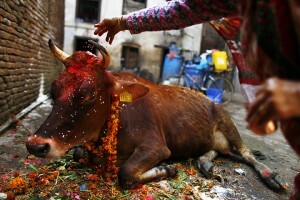 During the Gai Jatra festival, all families that have lost a relative over the past year are to participate in a procession in the public streets, most often in the nation’s capital of Kathmandu, being led by a cow. If the family is unable to obtain a cow for the event, then a young boy must be dressed up in a cow uniform. However, the outfit donned by the boy is not the traditional cow costume that some might expect. He wears a rather abstract, grotesque looking mask and is covered in layers of colorful clothing, often accentuated with a variety of flowers. Reportedly, if a man in the family passes, the boy dresses as a male, but if a girl is among the deceased, the boy dresses as a female. Those that gather to watch the procession may bring gifts to give to the boy, such as milk, rice or fruit. “It is fun to be dressed like this and receive lots of sweets and fruits,” Dilip Dangol, age 10, told Reuters. Christian missionary Jesse Boyd of Full Proof Gospel Ministries, who has regularly conducted mission trips to the country over the past decade, recently spent several months living and ministering in Nepal. He recalled an incident that happened during last year’s “Procession of Cows” festival as he and a fellow missionary preached outside of Swayambou Stupa in Kathmandu, also known as “the Monkey Temple,” which is one of Tibetan Buddhism’s most sacred sites. Cows are painted and donned with flower garlands during Gai Jatra. He further described the year-round atmosphere the country, where cows are allowed to roam free through the city. He advised that there are a number of festivals that take place throughout the year that include not only cows, but other common animals. 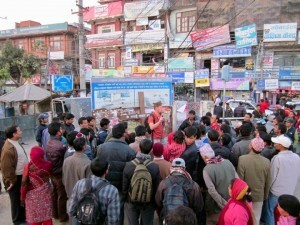 Boyd preaches to a crowd in Kathmandu, Nepal. 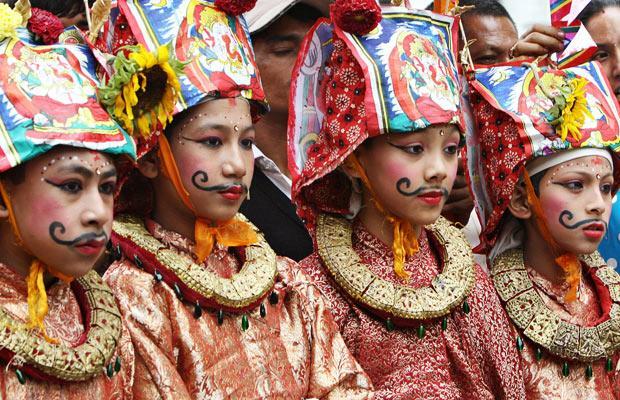 Boyd stated that only one percent of the Nepalese population professes to be Christian, with Hinduism and Buddhism being the prominent religion; therefore, festivals such as the “Procession of Cows” are widely celebrated. In light of this, he said that missionary work is not only necessary, but quite fulfilling. “All the religious superstition and the sacrificial system of Hinduism makes the book of Hebrews and the Old Testament typology of Christ as the sacrificial lamb of God good open-air preaching in Kathmandu and the villages,” he outlined. 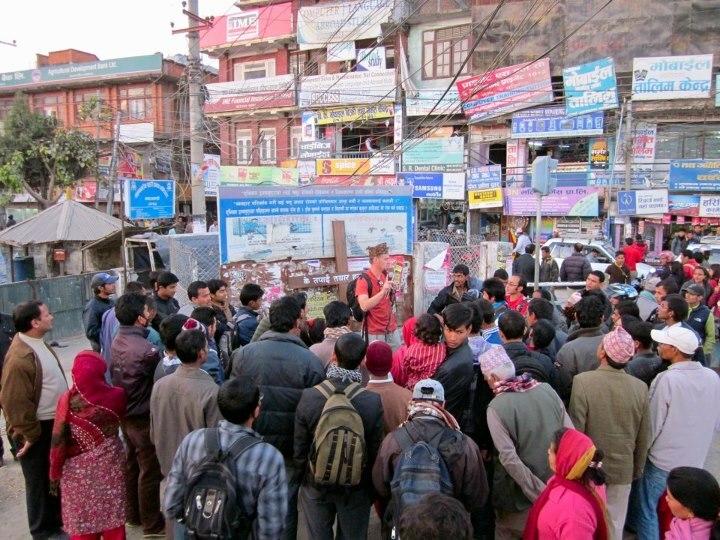 Boyd distributed over 123,000 Gospel portions and tracts while living in the country, and preached in front of many Hindu and Buddhist temples. The festival is held in different cities across the country and will be winding down in the next few days.